We offer 75 Miles for free with all of our Lamborghini rentals per day. After exceeding that mileage the rate varies based on the vehicle you select. 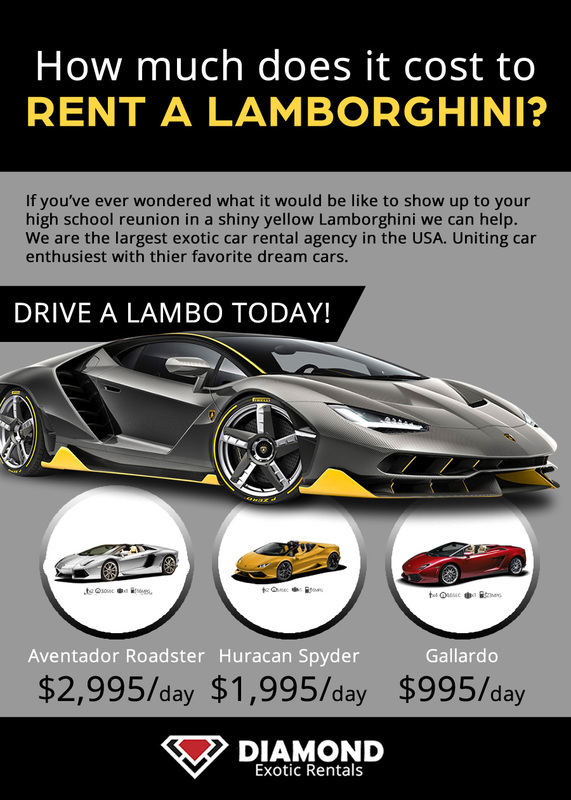 See chart below for specific Lamborghini rental pricing. In order to rent a Lamborghini, you must provide your own full coverage insurance and we will also place a hold on your credit card for a specific amount while you are renting the Lamborghini. Once the car is returned with no damages we will release the security deposit hold that was placed. Your current insurance coverage will automatically carry over and cover you when you rent a car from us. When you’re ready to rent a Lamborghini please give us a call and we will give you the best Lamborghini rental price that we can offer you. There is no such thing as cheap luxury car rental but we will try our best to give you the best rate possible. We want to make sure your Lamborghini rental experience with Diamond Exotic Rentals is an unforgettable memory that will last forever. Example: If you rent the Lamborghini Huracan Spyder for a day the first 75 miles are included in the rental price. Any miles you put over 75 will be billed at $1.95/mile. No reputable exotic car rental agency will offer you unlimited miles because it puts too much wear on the Lamborghini’s. If you are taking the car on a longer trip please give us a call and we will work with you and give you a package deal on the extra miles.